For some reason, LA has been unable to attract the kind of chef who does barbecue well. There are lots of servicable contenders in town: Dr. Hoggly Wogglys, Johnny Rebs, Baby Blues, JRs, Philips, Santa Maria BBQ. We won't mention the chains that do passable boiled versions dripping in overly sweet sauce. BBQ is near and dear to the FAQ (see my profile picture where I am working on one of the top two versions in my life) because it's very friendly to my system. If the meat is smoked slowly and correctly, it needs no wet tomato sauce to give it the flavor. (Since I'm allergic to tomatoes, I'm more fond of dry-rub bbq.) Bonus points are the Southern side dishes, I usually go for collards and blackeyed peas or corn, which deliver a perfect meal without feeling the least bit deprived! So it especially depresses me when I run into bad bbq. Really bad bbq. 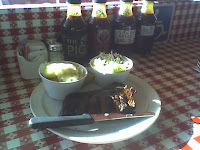 Which I had at The Pig (on La Brea) yesterday. I'm not usually in that neighborhood, and have only had the pulled pork there years ago which underwhelmed me. But a friend from the south said not to write it off based on that, and to try the ribs. So I ordered up some baby backs for $12.95. BLEAH. Bland and burnt, I could have done better at Tony Roma's, I am not kidding. The sauce was just average, and you had your choice of four levels of average, thank you very much. Sometimes, when you get average bbq, the sides make up for it. But damned if they were WORSE. On recommendation from the server, I got the sweet slaw instead of the Cajun style, and mashed potatoes since they were out of greens. After a bite of each, I shook my head in disbelief and horror because this combo tasted IDENTICAL to the processed versions served to you in little plastic cups at KFC, I kid you not. I devoured many of them as a kid, but my tastes have changed since I was eight years old, hel-lo. And the sad little piece of dried up cornbread hiding in the back wasn't even up to the Jiffy cornbread mix standard. Oy! This little place looks cute and tries hard to be authentically southern, but it only fell flat on its little piggy face. Run away.